We were invited to redesign the space to create a sociable place, a calming atmosphere, and opportunities for students to perform, display artwork, and take time out. The courtyard was sculpted into spaces of different size and character, using timber planters with built in seating. 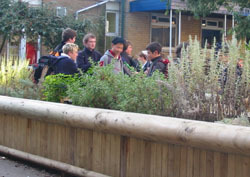 A further courtyard was later landscaped using the same modular design of seating and planters.